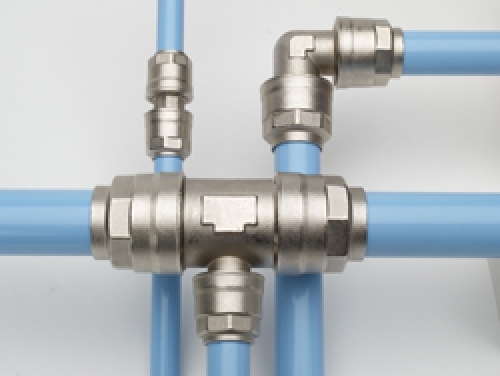 By choosing Patton's Inc. Infinity or Elevation Piping Systems, you're guaranteed a zero plastic piping system. Made with 100% metal, it's the most cost effective system available. Our non-corrosive push to connect or grooved connect systems are fully tested to ANSI B31.1 and are the most advanced systems available. Compared to your standard piping systems, Patton's Inc. Infinity & Elevation Piping provides aesthetically superior leak free system that includes a Lifetime Warrany. Select your color tubing to distinguish between gases; blue for compressed air, grey for vacuum, black for inert-gases and green for nitrogen specific installations. Contact Patton's Inc. by phone or email for a free complete analysis of your current piping system. In the market for a new or updated piping system? We'll design an efficient system that will be affordable, reliable and provide you with the best performance available. We'll be able to provide a complete system for your needs installed by a highly trained Patton's Inc. technician. Engineered for light commercial installations and OEM machine applications.From simple home garage users to hi-tech machine builders and conveyor manufactures, Quick-Fit meets every need. 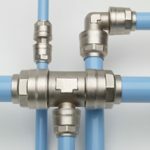 The unique features of Quick-Fit are its light weight marine grade aluminum tubing which will never corrode and its solid brass nickel plated fittings. 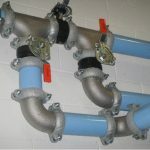 When the two components are combined you achieve an unparalleled quality that is not found in any other piping system. Installation of Quick-Fit is literally seconds and requires nothing more than a simple tube cutter and deburring tool for even the most complex installation. Cut, deburr and push together! levation provides the superior performance you need and demand from your air system with room to spare. Elevation is engineered to handle high volumes of compressed air. Simple to install, less than one tenth the weight of a conventional steel piping installation, Elevation will save time and money. Reducing installation labor while providing a rock solid leak-free system. Corrosion resistant, Elevation is made of marine–grade aluminum, lowering energy costs and requires zero maintenance. Versatile, Elevation can be used for compressed air, inert gases and vacuum systems alike. We back our systems with an industry-leading 10 year leak-free guarantee, making Elevation the clear choice for any user. Remarks or additional information you can provide to help us understand your requirement better.